This is a project for ages 5 and up - it can be quite simple (just make the top of the angel) or quite complex (make both pieces and decorate elaborately). 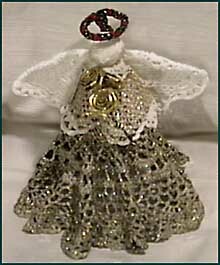 Doily angels can be Christmas tree decorations, or like this one, a beautiful Christmas tree topper. White crocheted doilies - for the full angel you'll need two: 4" and 6" diameter. Make a cut in the paper plates, from edge to center. Overlap the edges to make two cones, securing the edges with a stapler. Cover each cone with a plastic sandwich bag. Pour the fabric stiffener (available at the craft store, or make your own by mixing equal parts warm water and sugar) into a bowl. Dip a small doily into the bowl, saturating it thoroughly. Wring out the excess back into the bowl. Place a cotton ball in the center of the doily. Wrap a rubber band around the doily to secure the cotton ball for the angel's head. Drape the doily over the paper cone. Pull the back of the angel's skirt together (you can hold it in place with a paper clip if you need to). Fold the rest of the material down so that you have two wings spread out at the sides. Lay the angel gently on her back (with the wings spread out) on a piece of wax paper. Leave to dry (24-48 hours). Mix a little bit of gold paint or gold glitter with the fabric stiffener in a bowl. Dip the larger doily into the bowl and wring out the excess. Drape over the second cone. Arrange the skirt in nice folds and leave to dry. When both doilies are dry, glue the angel top to the bottom skirt. Decorate with gold cord, ribbon on the bottom skirt. For the halo, use a small piece of wired cord, or gold ribbon dipped in fabric stiffener and shaped into a halo. Glue the halo to the back of the angel between the wings. Our angel shown here is holding a few small gold roses. Her sleeves are actually one piece of gold wired ribbon, glued at the shoulder and bent in the middle. If you want to just make a simple tree decoration, just follow the instructions for the top of the angel. Attach a piece of string between her wings and hang from your tree.